The Mammen style grew out of the Jellinge style, and it can sometimes be difficult to tell them apart. The name comes from a small, decorated axe-head from a grave in Mammen, Denmark. Recent dendrochronological dating has suggested a date of c. 970 for the grave. The Axe is inlaid with silver wires: on one side is a foliate pattern; on the other side (shown here) is a bird. The body of the bird is thicker than the ribbon-like bodies of the Jellinge style animals: it is decorated with dots, and there is a large spiral hip. The wings and tail are drawn into long, curving tendrils. 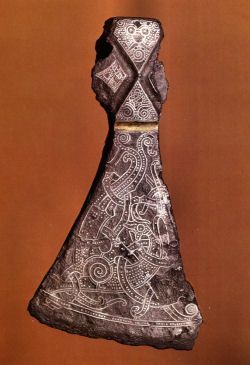 At the top of the axe is a human face mask with round eyes, a large nose and a spiral beard.